Republicans outnumber Democrats in Texas, if your measure is turnout for the two major party primaries. But in three of the state's largest counties — Bexar, Dallas and Harris — Democrats outran Republicans this year. Not every political consultant will flash their list of government seats they believe are up for grabs this year. But some will, and here’s the thing: The Democratic and Republican consultants agree on a lot of the names. Republican incumbents in Dallas County are at or near the top. That’s not really a reflection on the candidates themselves. It’s all about the numbers. Texas didn't see a blue wave in its March primaries. Measured by the number of voters they attracted to their primaries earlier this month, Republicans outnumber Democrats in Texas by a 3-to-2 margin. Another way to put this: In three of the biggest counties in Texas, Democratic primary voters outnumbered Republicans in 2018 — after trailing them in 2014. In 15 smaller counties, the trend went the other way: Democrats outnumbered Republican primary voters four years ago and the Republican voters outnumbered the Democrats this year. Those smaller flipped counties have 90,215 registered voters; the big three have 4.6 million. What’s notable now is the electoral danger posed to incumbent Republicans. They are numerous in those three big counties, providing the Democrats with ample opportunities. They’re nervous because their party’s president is facing his first midterm election, often a perilous time for that party’s candidates. Meanwhile, the Democrats have candidates in place to pounce as opportunities arise. 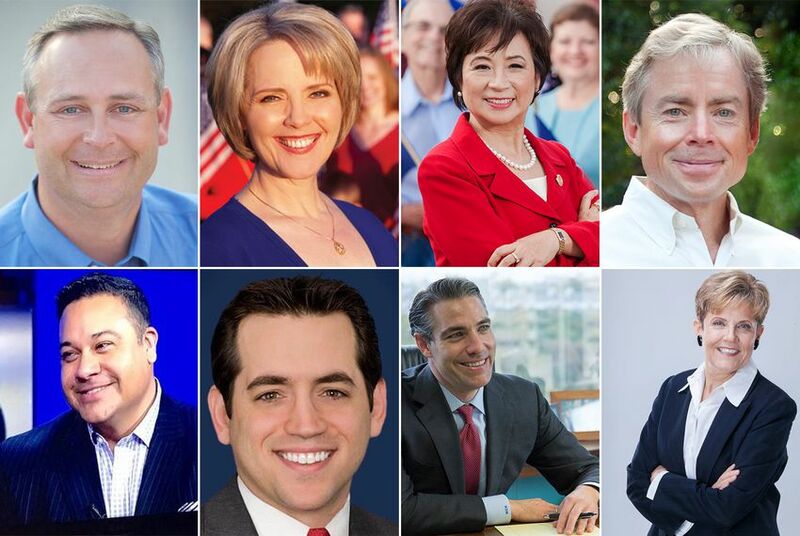 Dallas has been getting bluer for a couple of election cycles but still has eight Republican legislators in office: Rodney Anderson of Grand Prairie, Cindy Burkett of Sunnyvale, Angie Chen Button of Richardson, Don Huffines of Dallas, Linda Koop of Dallas, Morgan Meyer of Dallas, Matt Rinaldi of Irving and Jason Villalba of Dallas. Huffines is a state senator; the rest are state representatives. And two — Burkett and Villalba — won’t be back. She lost a primary for state Senate, leaving an open seat in the House, and he lost his re-election bid earlier this month. All eight seats are being contested by the Democrats in November. The Trump effect is impossible to gauge this far in advance. It’s not unusual for a president’s party to get lousy results in mid-term elections: Witness the Tea Party wave that swept a Republican majority into Congress in 2010 when Barack Obama was in the White House. That said, Hillary Clinton beat Donald Trump in each of the eight Republican seats in Dallas County. The Republicans on the Texas House side each outperformed Trump: That’s why they’re in the Texas House. They’ll have to do it all over again this year, with some evidence that the challengers are bringing more voters than they did last time. Harris County has 11 Republicans in the Texas House, and most of them are in seats that would be safe even if the president has a crummy midterm. Not everyone, however: State Rep. Sarah Davis of West University Place has a district where Clinton beat Trump by more than 15 percentage points. In Dwayne Bohac’s Houston district, Clinton eked out a thin win. Other state House members — Kevin Roberts, who’s running for Congress, Mike Schofield and Gary Elkins — each represent districts where Trump won by fewer than 10 percentage points. And state Sen. Joan Huffman's Houston district went to Trump by just 0.9 percentage points. Trump’s numbers make fantasy targets of members of the Texas congressional delegation who aren’t accustomed to November nightmares. The president won by fewer than 10 percentage points in five districts where Republicans preside: Sam Johnson of Plano, Kenny Marchant of Coppell, Michael McCaul of Austin, Pete Olson of Sugar Land and Lamar Smith of San Antonio. More to the point, Trump lost his election in three districts represented by Republicans — John Culberson of Houston, Will Hurd of Helotes and Pete Sessions of Dallas. Each has all or part of his district in one of those three big counties where — at least in the primaries — Republican voters are outnumbered.